Several years after Linn’s Classik arrived, Arcam began to reinvent itself by adding a range of sleeker, less specialist, music making machines. The Solo came first, and was a kind of ‘next gen’ Classik with cleaner and leaner looks than the Linn, beautiful finish and a slew of additional facilities. The Solo Mini arrived a year or two later, with similar internals rehoused in gorgeous half-size casework (a mixture of silver painted steel and an alloy fascia), and a cracking display that made it a joy to use. With around 40W RMS per channel into 8 ohms, the baby Solo went loud enough for most people. Inside, the usual sprinkling of good quality passive components were on show, along the de rigeur toroidal transformer. The slot-loading CD player section married a Sony transport (complete with CD Text) to a Wolfson 24-bit Delta Sigma DAC. The fascia was an ergonomic triumph, with a single front-mounted mini-jack input designed MP3 players, sitting alongside the 3.5mm headphone socket and USB type-A socket for playing music off memory sticks. A sleep timer, clock and alarm added to its ease of use and versatility. Source, volume and CD transport controls sat neatly on top of the fascia plate, and around the back a good range of inputs (including a tape loop, PC keyboard input, an optical digital output and multi-room socketry) could be found. By today’s standards however, the lack of digital inputs is surprising. 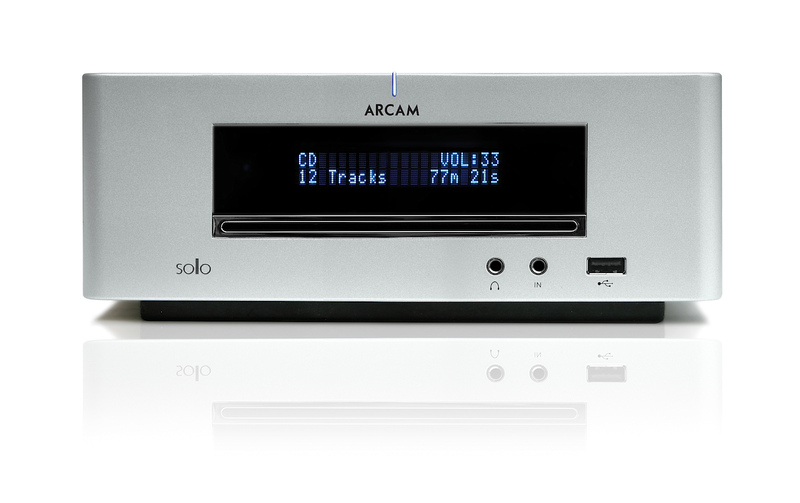 Sonically, the Solo Mini was Arcam through-and-through – smooth, refined and focused with plenty of pace and articulation across the detailed midband. Via its analogue inputs, music timed well and proved enjoyable in an unforced and natural way, although it was never quite as engrossing as the Linn Classik to listen to. Treble was typically silky from an Arcam, and bass decently solid albeit lacking that last few percent of punch that would really elevate the Solo Mini into hi-fi separates territory. Via the built-in Compact Disc spinner it really pulled ahead, giving excellent sonics considering the price of the unit. Another nice feature of the Solo Mini was its very well implemented DAB tuner. Few companies did Digital Audio Broadcasting tuners better, and this was surprisingly listenable as well as being highly accessible via that lovely frontal display. The FM radio was also done to a high standard, sounding obviously better than the DAB tuner, and pulled in stations surprisingly adeptly for something of relatively humble pricing. Overall then, here’s a lovely little music box – one of the cutest and most swishes small systems to surface in the past ten years. It is beautifully balanced sonically, finely finished and has superb ergonomics with real ease-of-use. If you can live without a built-in DAC, then what’s not to like, especially when they’re now popping up secondhand for a few hundred pounds?